Not a big fan of queuing, I only eat Aston when there is no queue, which means, I have only eaten it twice, once at Cathay, and recently, at City Square, Little India. 14K was very irritated at the service. Firstly, the waitress refused to give two of us a booth seat for 4 people but she later gave it to a couple. Secondly, the waitress asked us if we wanted to order first as they were clearing the table. 14K said no, we’d decide at the table. But she was persistent and asked again albeit in a polite manner. I ordered the Prime Sirloin ($11.90) with 2 side dishes of onion rings and potato salad and 14K the Potato Queen had the New York Strip ($14.90) with mashed and baked potato. 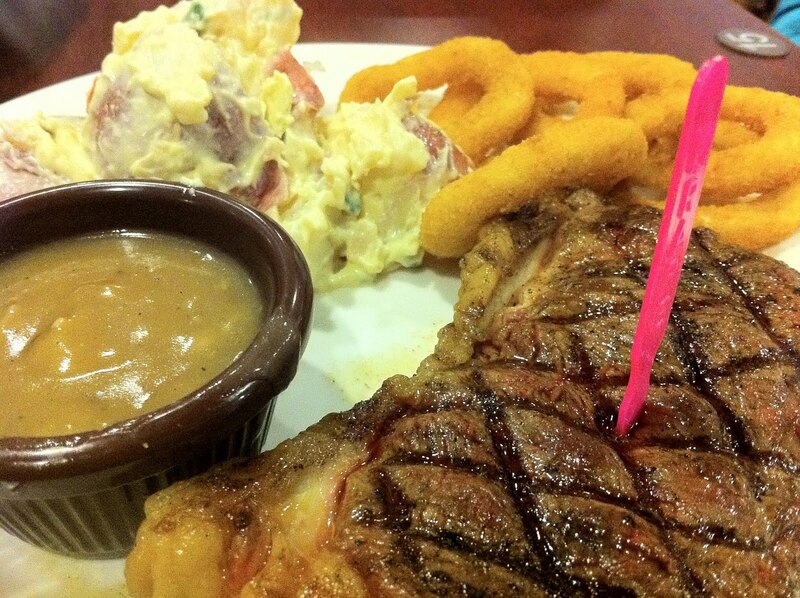 When I was on the South Beach Diet, there was specific areas of the cow you could eat, the less fat portion. If I remember correctly, the tenderloin, top round and shank are the less fat parts. I ordered sirloin because it’s near tenderloin – so it may be less fat too? The sirloin was less thick and small than the Strip. I ordered medium-rare, which is how steaks are best to be eaten, and 14K ordered medium. Mine turned out to be rare, while his, to be medium-rare. Maybe it’s because they are always busy, so they cook the steaks for less time. Tip: Order your beef one grade longer. 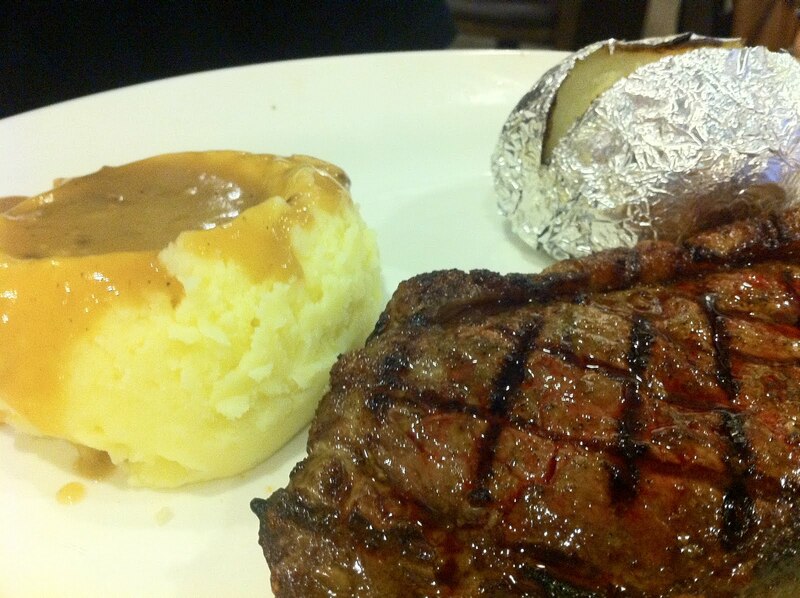 So if you want it medium-rare, you should order medium. The steaks were also too bloody. However, besides the blood and the undercooking, I love it. The quality was very consistent for the two outlets. The beef was tender and tasty. The side-dishes were satisfactory. When I said I love Astons, 14K said, chey it started off as a kopi tiam. I’m ah beng ok!?! don’t despise my $6.40/bottle of beer kopi tiam!! Overall, good and value for money, but you have to pay for water ($0.30), which I don’t like. But I still won’t queue for it because there are good food everywhere in Singapore.